Auntie M has been encouraging readers to investigate Nicola Upson. With her background in theater and as a crime fiction critic, it is easy to see how Upson’s research into the life of Elizabeth Mackintosh led to this very original series. Upson is also the author of two non-fiction books, and studied English at Cambridge. Upson became interested in writers working between the two World Wars, which led her to Mackintosh, who wrote plays and mainly historical fiction under the pen name of Gordon Daviot. When she turned her hand to some of the most original crime novels of 1930’s-1950’s, Mackintosh wrote under the name Josephine Tey. It is Upson’s own original device in this series to star Tey as the protagonist in her mystery novels, and it is highly effective. Following the authorship of Tey’s real novels and life events, Upson brings to life the era and settings that Mackintosh inhabited, weaving in aspects of her life with that of Tey and her friends in the theater. 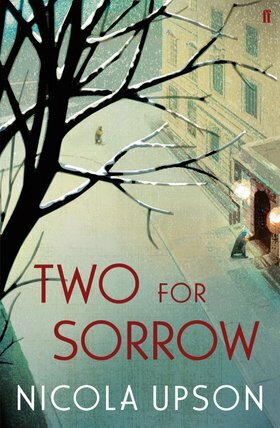 In her third Tey novel, Two for Sorrow, Upson has Tey in London doing research for a possible novel based on the last double female hanging at Holloway Prison in Britain. The book follows two stories: Tey’s research into the life of the two women convicted of murdering newborn infants taken from their mothers for adoption; and the murder of a young seamstress who has been found murdered under horrific circumstances in the design studio of the Motley sisters, Tey’s friends. Tey is staying at the Cowdray Club, a club for nurses and professional women where Mackintosh was a member from 1925 until her death in 1952. The club is the planned setting for a lavish charity gala with surperstars headlining the fundraiser, and the Motley sisters are designing many of the dresses for the prominent women attending. Inspector Archie Penrose and his team investigate the young woman’s death, which at first appears to be laid at the door of her abusive father. Penrose is not convinced this is the case, and he enlists Tey’s help in finding the real murderer, even as she continues her own novel’s research, which includes a visit to Holloway. The lives of several women living at the Cowdray Club are brought under Archie’s spotlight, and Tey finds herself at times uncomfortable with Archie’s investigation. Then as he becomes convinced he is on the trail of the murderer, a second young woman suffers a terrible accident and the race is on to unearth a sadistic killer. Upson’s settings are vividly described and recall the era perfectly. She also mines the reserve of the time and the simmering emotions that lie just beneath the surface of most personal relationships. Her research is exhaustive and we are the happy recipients as she expertly overlaps the real with the fictional. The two main story lines overlap in several places that heighten the tension. The entire novel is bolstered by an intriguing subplot featuring Tey’s private life. Auntie M had to do a little research of her own to find that this, too, was based on what can be gleaned from Mackintosh’s very private life. P. D. James has remarked that Upson “. . . is to be congratulated” and Auntie M agrees. Don’t miss this third strong outing in a consistently entertaining and well-written series. I’m heading to the bookstore as soon as they open. I re-read Daughter of Time every five or six years, so I’m intrigued with this concept of Tey as protag. Wish I’d known about Upson when I was doing my Mystery Matters radio show in 2009. She would have been fun to interview. Oh well… I’ll get to know her through her writing.